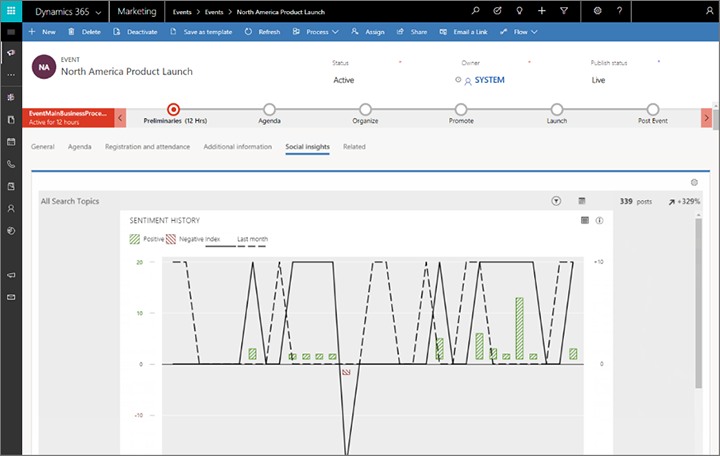 The October 2018 update of Dynamics 365 for Marketing is released and available for customers to install and update starting now! This is the first major update to the product since its release earlier this year. It includes many new features, plus plenty of performance and stability improvements. With account-based marketing, business-to-business (B2B) marketers can target each business account as a single unit, thus increasing integration and alignment between the sales and marketing departments. Generate demand and close more sales by targeting specific accounts and tailoring your messaging for those accounts to ensure relevance and value. Align sales and marketing departments by mapping marketing activity to account strategies. Increase return on investment by removing waste and focusing on targeted, high-value accounts. Increase account relevance by providing personalized and compelling content. Generate efficiency by identifying specific contacts at specific companies within a specific market. Identify and create segments of high-value accounts. Identify key stakeholders to reach within each account. Create personalized content, such as emails, based on account. Generate account-level leads and nurture them through the demand-generation funnel. Continuously measure account engagement and optimize your messaging. For more information, see Account-based marketing in the online help. Reusable content blocks let you define and store reusable blocks of content that are easy to add to email and page designs. You can even include dynamic values from Dynamics 365. For example, if you’ve created a beautiful header for a marketing page, you can make it a standard design element by saving it as a reusable block. Because you can choose to restrict other users’ ability to edit the content of a content block, you can improve compliance with your brand identity and organizational design standards. Use the new content-block designer to define the content, design, and rules for each content block. Users can then drag and drop these elements into their email and landing page designs. Each block could be as simple as a call-to-action button, or as complex as an event countdown timer. For more information, see Create content blocks in the online help. Social listening analyzes social-media channels to find relevant posts and evaluate user sentiment related to any topic you choose. 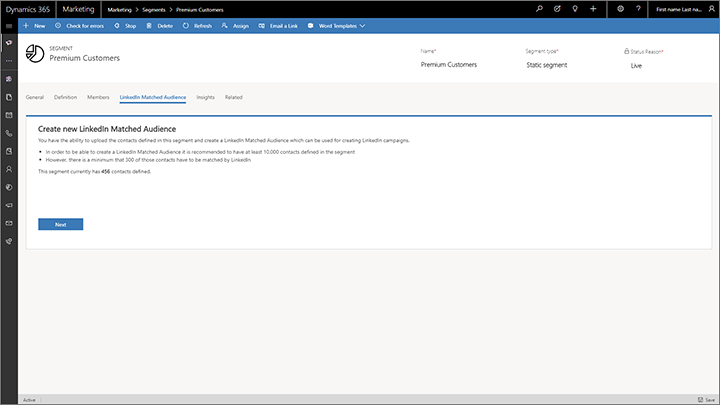 Then you can place relevant social-media analytics right next to the other insights you’ve collected for any customer journey, account, contact, or other relevant record in Dynamics 365 for Marketing. Establish a collection of specific phrases that relate to a customer journey or event, and then monitor social media posts for mentions of those phrases. Social listening gathers data from all the major social networks and populates the various widgets on the social tab with relevant analytics that reveal how often each phrase is mentioned over time, the sentiment associated with each mention, potential influencers that mention the phrases, and much more. For more information, see Set up social listening and add it to any record in the online help. The marketing calendar provides a visual overview of any marketing activity that has a start and end date. 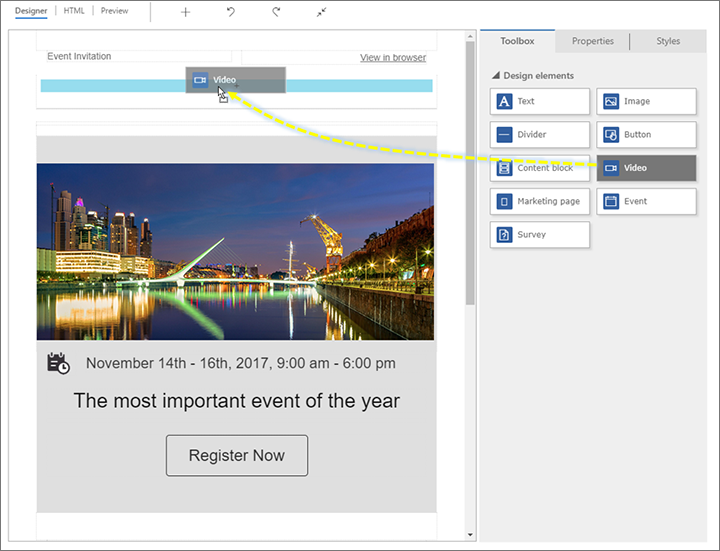 For example, you can view many elements of a campaign (such as events, event sessions, customer journeys, appointments, and more) on the same calendar to get an easy overview. Event planners can view or create sessions straight from the calendar while accounting for room and speaker availability—all without leaving the page. For more information, see Work with marketing calendars in the online help. Deep LinkedIn integration makes you better able to generate leads from professional networks and relationships. New integration features let you run journeys that specify targeting on LinkedIn and leverage resulting interactions for orchestration, scoring and segmentation. Integrate Dynamics 365 for Marketing segments with LinkedIn Matched Audiences. Orchestrate journeys that includes triggers that react to submissions from LinkedIn Lead Gen Forms. 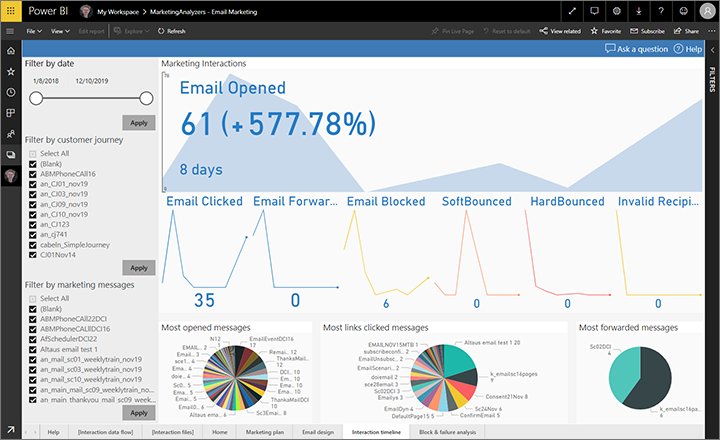 Evaluate the success of your LinkedIn campaigns with engagement statistics in Dynamics 365 for Marketing. Generate leads at the account or contact level when retrieving form submissions from LinkedIn. Nurture leads with lead scoring based on LinkedIn form submissions. The improved segment designer enables marketers and business analysts to create segments more easily and efficiently. A host of new business-centric operators will make it simpler for business users to create complex, business-centric marketing segments, allowing them to easily create segments for targeted marketing. 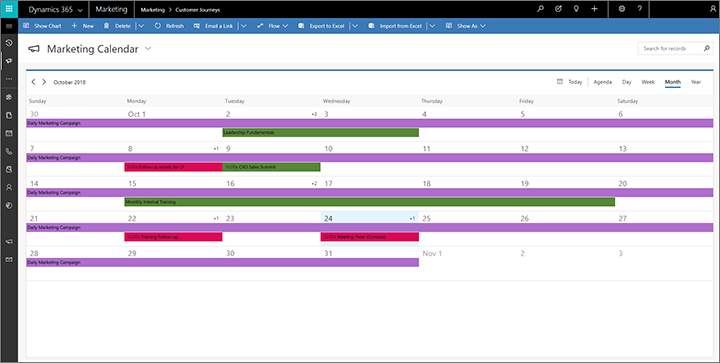 Dynamics 365 for Marketing collects wide-ranging and detailed information about how contacts interact with your marketing initiatives. Use custom analytics to organize and present this data within the Marketing app. Custom analytics can help deliver actionable insights based on data from Marketing and other business applications. View reports that are fine-tuned to your business processes and use them to identify ways to run more efficient and effective campaigns. In the future, we’ll also deliver insights based on machine learning to help you get even more out of your business data, acquired data, and unique Microsoft data sets. 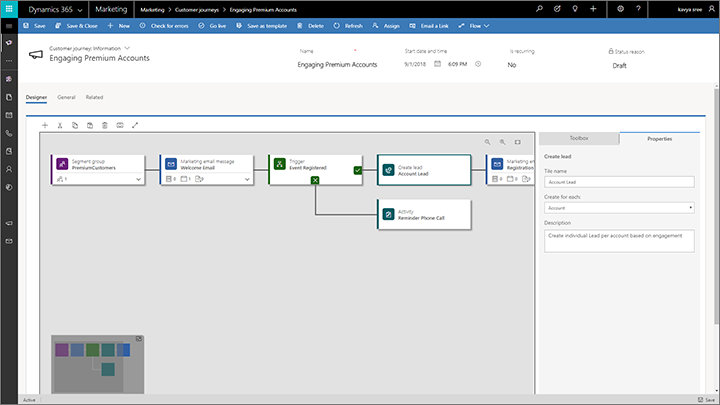 Use Dynamics 365 for Marketing to build custom analytics that support your organization’s specific business processes, drive good decision making, and deliver results. Design charts, graphs, and KPIs that you can embed right into the app, where marketers need them most. You must bring you own Azure Blob Storage to use this feature. The Marketing app must be able to connect to this resource and store marketing data there. Alternatively, you can build Power BI reporting leveraging custom mapping for the marketing data stored on Azure Blob Storage. For more information, see Create custom analytics with Power BI in the online help. Online videos are an essential part of marketing, and the fastest-growing medium for reaching newer and wider audiences. 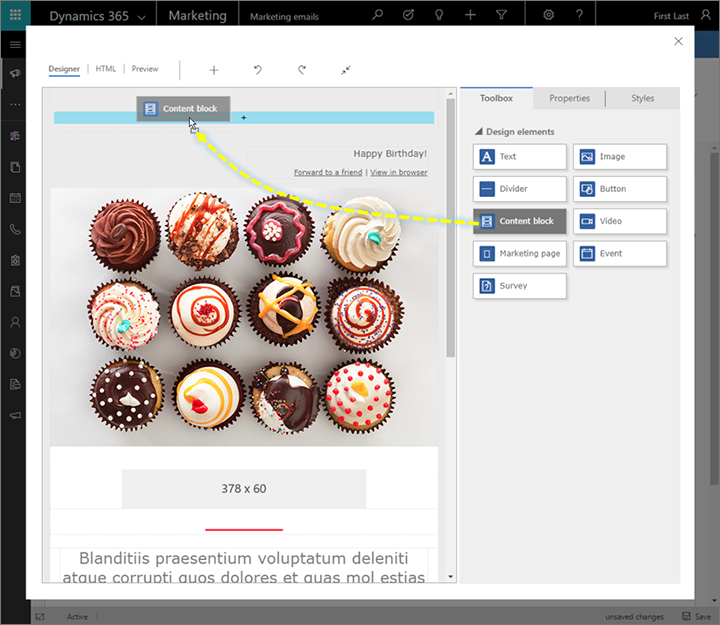 Dynamics 365 for Marketing now provides native support for embedding videos in marketing communications. The new videos feature adds a video design element to the content designer. To add a video to any marketing page, just drag a video element from the toolbox, drop it into place on your design, and choose which video to include. For more information, see Create a video library and add videos to your designs in the online help.